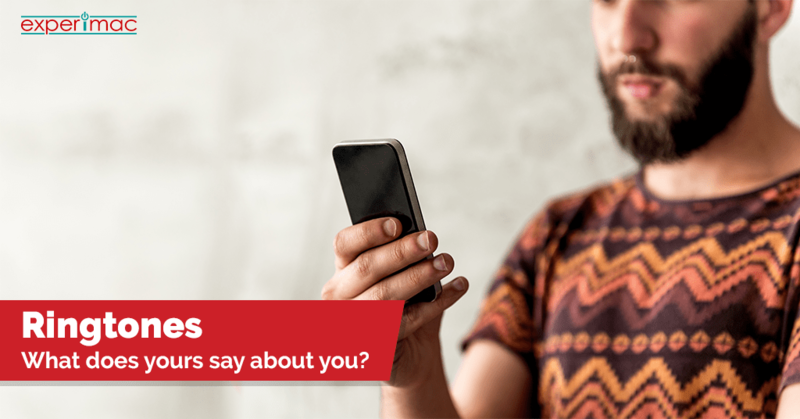 Did you know that the ringtone you pick for your phone, or decide not to pick, can actually say something about you? Psychologists agree that whether your ringtone is a pop song, a traditional ring or even silenced, it means something and demonstrates personality traits about you to the world around you. An older rock song could date you, but it also means you know your way around technology. You feel confident with your age and you’re not afraid to hide it. If you’re a younger person with a song that outdates you, you are an independent thinker who is not afraid to part ways with current trends and expectations. Using a ringtone already installed in your phone could mean that you’re down to earth and practical. You’re happy with the simple things in life and choose to spend your time on things that matter more than a ringtone. If you stay current and use hit pop songs as your ringtone, you are a person who loves variety. You are adventurous and love new experiences. You probably do your best to stay aware of current trends and change your hairstyle as often as you change your ringtone. Having classical music as a ringtone could go one of two ways: you are both refined and sophisticated, or you are very stressed out. Classical music is proven to calm nerves, and your ringtone may be what you use to destress, particularly if you get a lot of work-related calls. The person who interrupts a meeting because of their phone is not only demonstrating bad business etiquette, but they are also giving you insight into their personality or lifestyle. They may be self-centered, forgetful or even overwhelmed. Either way, leaving your ringtone on during a meeting is not the best way to make a good impression on others. The person who always leaves their phone on silent is usually someone who puts the day-to-day activities in front of them before phone calls, and loves to live in the moment rather than on the phone. However, be careful, this could be misinterpreted as being unreliable or antisocial. The person who never picks up calls is often someone who is overwhelmed with pressing matters, or is someone who doesn’t care to speak on the phone and would rather be left alone. Again, this can be taken either way, so be mindful of the calls you are choosing not to answer. The person who answers calls right away can be seen as dutiful, helpful, but also over-eager. If you’re the kind of person who picks up calls at inopportune times, you could be making a horrible impression on those you care about or with employers. Make sure you are making the right impression with your ringtone and sound settings as well as your phone etiquette. If you need help with your iPhone® device’s ringtone settings, no worries! Visit your local Experimac to see what our highly experienced technicians can do for you today. Author ExperimacPosted on July 25, 2017 Categories BlogTags 000, Choosing the Right Ringtone, What does your Ringtone Say About You? For those with a long commute or for those who love to work out, music is often the most motivating part of the commute or workout session. Whether your playlist includes The Beatles, Rihanna or Keith Urban, listening to your favorite artists can help you relax, focus and get your blood pumping. 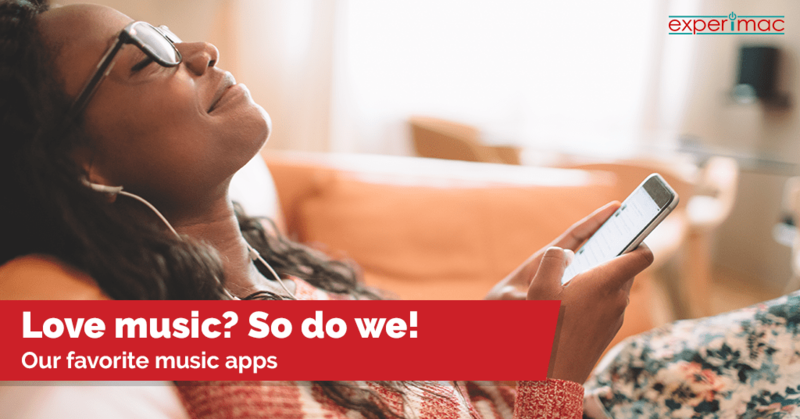 Check out these free music apps we love. They will make it easy for you to listen to the artists you love, discover new music, identify songs, and even find radio stations near you. iTunes – Media player, media library, online radio broadcaster, and mobile device management app – iTunes does it all. Through the iTunes Store, you can buy and download music, music videos, audio books, podcasts, and even TV shows, ringtones, and movies. Play, download and organize your favorite music using their user-friendly interface. Pandora – A free music app that streams songs for you to listen to. You enter your favorite artist’s name and Pandora will play songs by them and other similar artists they recommend. You rate the songs and bookmark your favorite artists. Spotify – On Spotify, you can follow artists and sync music from your desktop. You can create a station so Spotify will play songs similar to your original music selection. You can also find music by viewing top lists and new releases or searching for playlists and favorite artists and albums. Add your favorite songs to a music library and play them again later. Want to know when your favorite artists are releasing new albums? Set up a push notification for that. Shazam – If you haven’t used Shazam, you have to try it out! The app listens to a song and then tells you the name of the song and the artist. Then, you can share the song, watch a music video on YouTube, play it on Spotify, find tour info, create a Pandora station based on that artist and more. iHeartRadio – Are you looking for a radio app for your mobile device? iHeartRadio will do that. It supports tons of devices, has zero commercials and can find radio stations near you. You can create your own music stations based on your favorite songs, search for stations, listen to podcasts, save favorite stations as presets, set as an alarm clock, view lyrics as you listen, read a bio of the artist and much, much more. Amazon Music – You can load up to 250 of your own songs to your Amazon account so you have access to them from a mobile device. You can download your music offline, allowing you to listen to the music from the app even without an Internet connection. Organize playlists, add existing playlists from your device. If you’re an Amazon Prime member, you get an ad-free experience and unlimited access to millions of song selections. If you can’t imagine getting through your day without your favorite music, you have to check out these free apps. Having trouble with your headphones or downloading the apps on your iPhone® device or iPad® tablet? Stop by your local Experimac today and we’ll run a diagnostic check to make sure everything is working properly so you don’t have to suffer through the day without your favorite music to keep you going. Apple® Desktop Computer Models: Pros and Cons. Why Should I Buy Certified Pre-Owned? Which Apple desktop should you buy? Below, we weigh the pros and cons of each Apple desktop model and provide additional information on what you can expect when you purchase a certified pre-owned computer at Experimac. Here at Experimac, you don’t need to sacrifice your needs or wants because of expense. At Experimac, you get the original tech at a fraction of the original price. Our customers save an average of 60% on our certified pre-owned Apple products over big box retailers. The certified pre-owned computers we carry have undergone a rigorous evalualuation. Our techs inspect, grade, clean and test all of our pre-owned products and install the latest licensed operating system available. In order to be sure these computers work just as well as they did the day they were first used, all components of the computer are thoroughly examined, tested and retested to ensure quality and reliability. Even after this thorough examination, Experimac is still able to bring you certified pre-owned computers at a fraction of the original price. Additionally, when purchasing from Experimac, you have the opportunity to see the product in person yourself, ensuring a safe transaction from a reputable retailer. 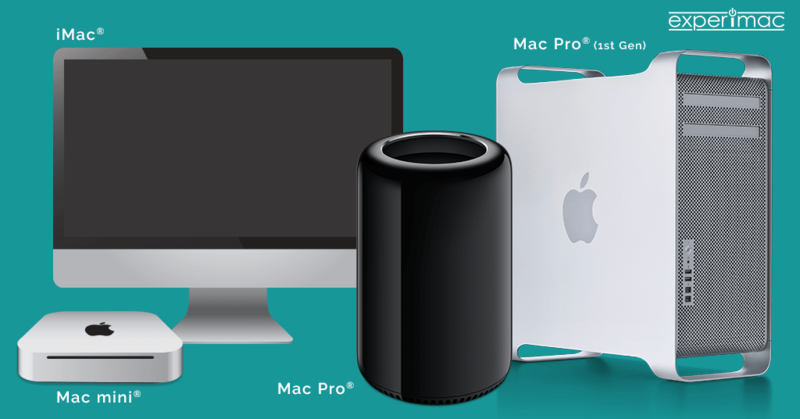 The iMac® computer, Mac Pro computer and the Mac Mini® computer are all Apple desktop options. The Mac Pro is the king of all Apple devices. It’s motto “Built for creativity on an epic scale” is very fitting, as this computer is a powerhouse. However, if you’re not running Pro level software such as Final Cut Pro X®, Logic Pro X®, or any others of that caliber, then the Mac Pro computer is most likely more machine than you need. If you like the idea of a powerful desktop but don’t need the strength of the Mac Pro computer, consider taking a look at higher-end iMac® models. The iMac computer comes in various sizes and capabilities, most of which are more powerful than the Mac Mini computer, yet not as powerful as the Mac Pro computers. The entry-level iMac computers offer similar abilities to that of the Mac Mini computer; if investing in an iMac computer, it is wiser to go with the higher end variations. The iMac computer is the perfect choice for working at home and gaming. The Mac Mini computer is a great at-home, general desktop to be used for basic functions such as exploring the Internet or creating basic documents. Though it is not as strong as other Apple desktops, the Mac Mini computer is a wonderful option for those looking for a very basic, energy-efficient device. The Mac Mini desktop is a great option for a first Mac computer or for anyone who doesn’t need a powerful device. You can’t go wrong with any of Apple’s products; they are beautifully designed and are powerful machines built to last. However, with so many options, it can be frustrating picking the perfect model. Stop by your local Experimac today to get more information on all of our certified pre-owned Apple desktop computers and find out which model fits your needs best. 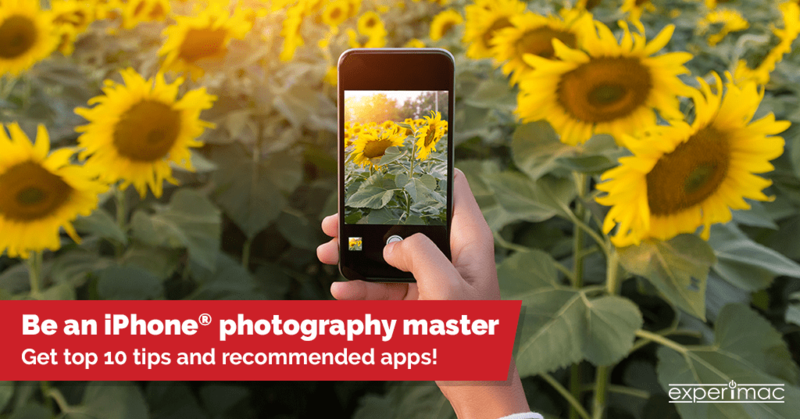 Want to be an iPhone device photography expert? We’ve put together Experimac’s tips for taking the best portraits, landscape and action photos along with the top editing apps and filters. It’s time to take some epic summer pics! The perfect moment to snap a picture can happen at any time. Isn’t that why we use our phones to take them? Do not waste time unlocking your phone to take a picture, simply swipe up from the bottom of your lock-screen and snap a shot. Don’t worry about privacy, your stored pictures cannot be accessed if you lock your screen. The iPhone device’s thin design, while sleek, can make taking pictures difficult, particularly selfies when you want to be sure you have a good grip on the phone. You may find it easier to use the volume buttons to take pictures instead. High Dynamic Range, or HDR, could drastically improve your pictures by allowing you to take pictures that may have high contrast light, such as a bright sunset, without distorting any part of the picture. You can turn this feature on or off at any time, but many find it helpful to rely on iOS 8’s HDR Auto feature which leaves it up to your iPhone device’s sensor to turn it on or off. Summer time typically brings adventures and trips out and about. That doesn’t mean your pictures have to be blurry. Use Burst Mode when chasing after the kids, going for a ride or for any picture you try to capture in motion. By taking pictures in burst mode, the quick succession means a better chance of getting a clear shot of the image you want in addition to more options to choose from. iPhone devices have a grid option installed. It is designed to help you keep your pictures balanced, straight and on-point. You can enable this feature by going to the camera section of your iPhone device’s settings. There are many applications that you can use to spice up your photos and edit colors and crop any image. These apps can be particularly beneficial if you plan on uploading pictures to social media accounts. Some apps such as Snapchat or Instagram offer their own fun and colorful filters for pictures and videos. Test them out and see what you come up with! This free photo editing app easily handles any of your iPhone picture enhancing needs. You can use it for processing techniques, including exposure, color, cropping, sharpening and perspective correction. You can even remove unwanted objects from your photos, or use the Brush or Selective tool to adjust the color and brightness of just one part of your photo. PicsArt is a free app that delivers in an easy-to-use format for editing photos. With this app, you can create fun layouts, collages and mashups of all your fun summer pics. Make your social media picture posts more interesting this summer with this app. This free app from the creators of Instagram makes everyday moments fun and unexpected. With this app, you can create captivating mini videos that loop back and forth, then share them with your friends. Make a fun short video by finding something that’s moving, or create a video-selfie by switching to the front-facing camera. Designed to help you optimize your selfie-game, YouCam has the easiest-to-use beautification tools that provide amazing results, plus other editing options and collages. Anyone who is serious about their selfies will love this app. Having trouble with your iPhone device’s camera? Get that fixed before summer kicks into full swing at your local Experimac store. No appointment is necessary and most repairs are completed while you wait. Using electronic devices should be a positive and fun experience for all of the members of your family. However, it is important to understand that exposure to digital media should be limited for children. Not sure what those limitations should be? Take a look at the tips we have listed below. Under 18 months – Infants should not be exposed at all. 2-5 years old – Should be limited to one hour per day. 6 years old and older – Parent discretion should be used to determine the duration as well as the content the child is exposed to online. However, originally, doctors claimed over two hours of exposure a day could be damaging. Monitoring the time your children spend on the Internet is vital to their health and well-being biologically, as well as for their emotional well-being. With older children, the concern regarding digital media exposure is more about the material they may be exposed to. Sometimes, it can be tough to moderate their online choices. It’s important to establish trust in your child; however, keeping your children happy and safe online works best when you can maintain honesty in addition to some basic levels of protection. Parental controls may be a good option for your family if you are worried about they are exposed to online. These controls are designed to protect your children as the Internet can be a very dangerous place if not moderated. From child predators to sensitive and inappropriate information, parental controls are designed to protect your children from the dark corners of the Internet. There is a great variety of parental controls available. 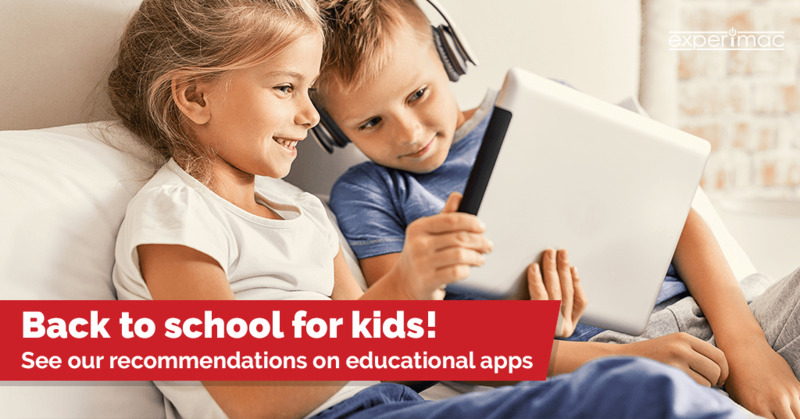 There are some designed for specific ages and operating systems, and there are also more specific parental controls designed for targeted ages and purposes. 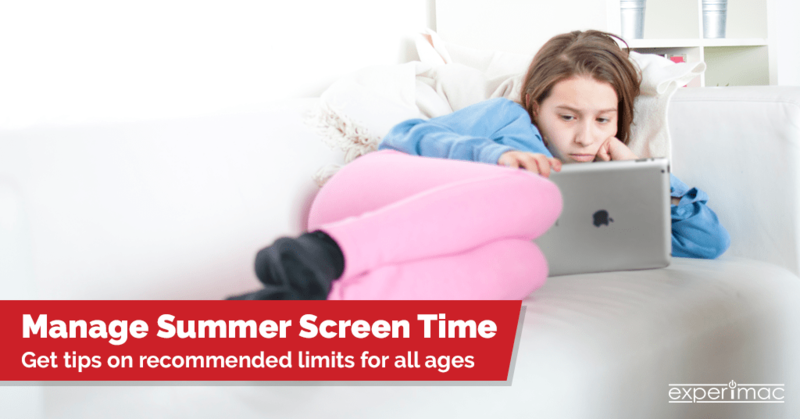 Parental controls can be set up on your smart phones, tablets, laptops and other electronic devices. Curious about what parental control options would be the best fit for your family’s needs? Call your local Experimac to find out more or stop by and we’ll be glad to discuss the best options for your family. You may already use Yelp, but we suggest using Foursquare as it is especially adept at helping you find things you might want to see close to you such as museums, parks, restaurants, monuments and other nearby spots of interest. You’d be surprised what’s going on around you, Foursquare can help you find something new to try. There aren’t descriptive reviews in the app, but rather advice that other Foursquare members post to help. Customize all of your travel arrangements in one place with this app. GateGuru allows you to find maps, weather info and tips for your destination. Keep track of how many miles you’ve flown, and compete with friends and family. You can even look up flight alerts and TSA security wait-time estimates. The journey is better than the destination, particularly if you’re familiar with Roadtrippers. This app asks for your start and end destination, and any destinations you want to hit in between. Then, Roadtripper navigates in-app and points out any important and hidden spots you missed. You can even add your discoveries for others to find along the way. This app will surely turn an otherwise long and boring road trip into a fun trip the whole family will never forget. Traveling means visiting new places and meeting new people. Sometimes meeting new people means introducing yourself to new languages. Google Translate is the app to have if you plan on venturing to a destination with a different native language. It provides you with translations in any language, visually and with audio. This will make ordering your meals and seeking assistance a lot easier. You may think that money is the last thing you want to worry about while on vacation. However, the last thing you want to experience after months of saving money to go on vacation is to misspend and regret not having budgeted properly. Trail Wallet helps you keep track of what you’ve spent, as well as keep tabs of how much you have left. You can create daily limits and break down what you want to spend your funds on. The National Park Service has developed an app for many of its National Parks. 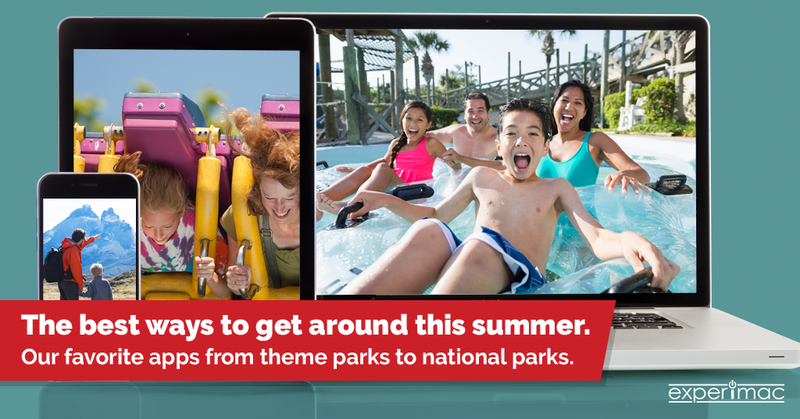 Look for the park you will be visiting and download the appropriate app whether you’ll be in Washington, DC visiting the National Mall or you’ll be on the west coast in San Francisco spending the day at Golden Gate National Recreation Area. Use these apps to get more information about the nation’s most cherished cultural and historical sites. Make reservations for dinner right from your phone. Are your trying to visit the latest hot spot in your destination city? OpenTable can connect you with the top restaurants in cities across the US and around the world. Each month, OpenTable diners contribute over 850,000 reviews about their restaurant experiences so you will know whether the restaurant you’re considering is a good choice or not. Whether you will be traveling around the US or around the world, do your research. There are so many amazing places to visit and you will want to be prepared so you don’t miss anything. If your iPhone® device or iPad® tablet is not performing well for some reason, stop by your local Experimac before you head out on your trip so we can make sure it is working well and you’ll be able to use all of these great apps and take some fantastic photos of your adventure.